Castine, Me. 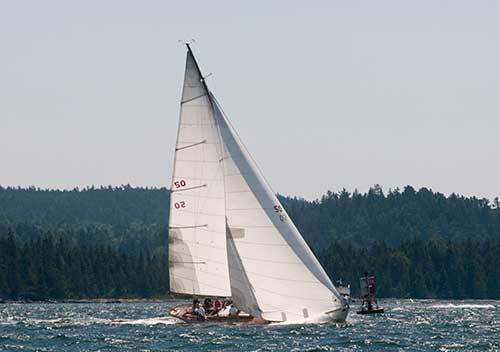 In the seventeenth annual Castine Classid Yacht Regatta, Sonny, a 53’ Sparkman & Stephens sloop built in 1935 and sailed byGeorge M. Isdale, Jr, led a fleet of thirty classic yachts to win the coveted Ames Cup, repeating her 2015 victory. The Ames Cup honors the memory of Richard Glover Ames and Henry Russell Ames who were lost at sea on June 9, 1935 south of the Grand Banks in an unsuccessful effort to save their father, who was washed overboard during the Newport to Bergen, Norway, yacht race. The Ames family hailed from Castine. This year’s Castine Classic Regatta, sponsored by the Castine Yacht Club, celebrated the historic yachts Dorade and America, with an exhibition at the Town Dock and symposium at the Maine Maritime Academy. The 52’ yawl Dorade, designed by Olin Stephens in 1929 at age 21, took the sailing world by storm, scoring decisive victories in 1931 in the Transatlantic and Fastnet races—to be greeted upon its return to New York with a ticker-tape parade from the Battery to City Hall. Dorade then went on take her class in the 1932 Bermuda Race and to win the 1936 TransPacific Race. Over 77 years later, Dorade has just achieved amazing success in these same races. “Dorade’s return to ocean racing is one of the great stories of yachting, both classic and modern,” commented Doug Adkins, author of the definitive Dorade biography and chair of the MMA symposium. The 139’ schooner America is a replica of the vessel which started the America’s Cup tradition in 1851 by defeating the British to win the Royal Yacht Squadron’s “100 Guinea Cup”. A large group of visitors boarded these iconic yachts and attended the symposium featuring Pam Rorke Levy and Matt Brooks, owners of Dorade; Troy Sears, skipper of America; John Rousmaniere, famed maritime writer; and Mark Gabrielson, author of fascinating story of the Deer Isle fisherman who crewed two America’s Cup victories in the 1890s. The Castine event kicked off three days of classic boat racing, culminating in the Eggemoggin Reach Regatta. 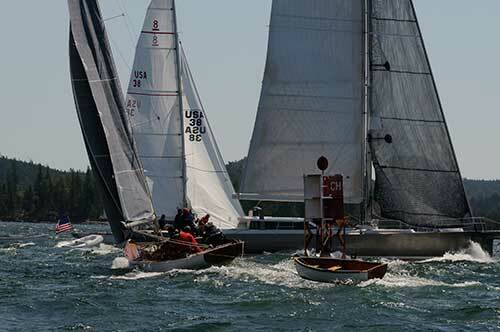 The 19.6 mile race from Castine to Camden, sponsored by the Castine Yacht Club, was sailed in “ perfect conditions—under clear skies and steady 15-20 southwest winds”, reported event chairman, David Bicks. The yachts beat down East Penobscot Bay, rounded Robinson Rock off the southern end of Islesboro , and finished under spinnaker off Curtis Island in Camden. In the Classic A class, Sonny was followed by The Blue Peter, a 64.5’ Mylne designed sloop built in in 1930 and sailed by Mat Barker. The famed yawl Dorade, sailed by Matt Brooks, took third place. 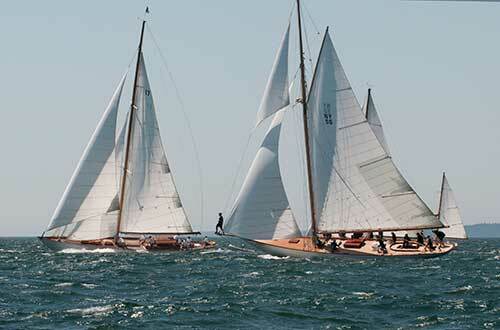 The Class A fleet included a highly competitive match race among four 45’ NY-32s designed by Olin Stephens in 1936, with Siren, sailed by Peter Cassidy, taking honors. In the Classic B class, Palawan, a 47.5’ S&S yawl launched in 1952, sailed by Scott Gazelle, bested Fidelio, a 38’ S&S Finistere yawl built in 1956 skippered by Chuck Townsend. 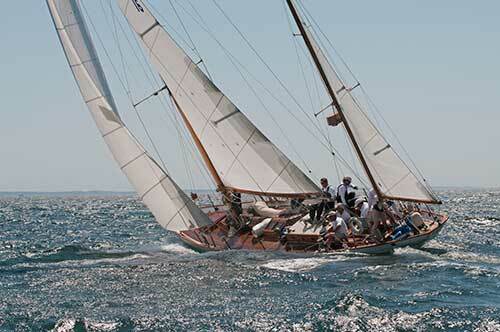 Rogue, a 37’ Herreshoff/S&S sloop built in 1953, skippered by Seville Simonds, followed in third place. 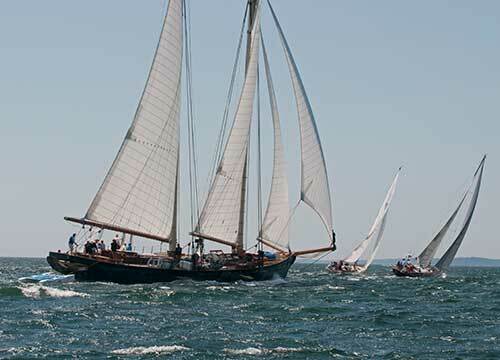 The Class B fleet included three Concorda yawls, with Otter, sailed by Robert Keefer, winning the Phalarope trophy, awarded to the top Concordia yacht in memory of Thomas G. Ashton of Castine. In the Spirit of Tradition class, Isobel, a 68’ sloop designed by Stephens-Waring, built in 2011, at Brooklin Boat Yard, and sailed by Richard Schotte,,claimed first place honors. Aurora, a 55’ IMS racer sailed by JB Turner, took second, followed by Vortex, a 52.5’ Reimers sloop skippered by Steve White.